Show Quality Body, Paint, Interior and Engine. Comfortable and Prepared to be Driven. 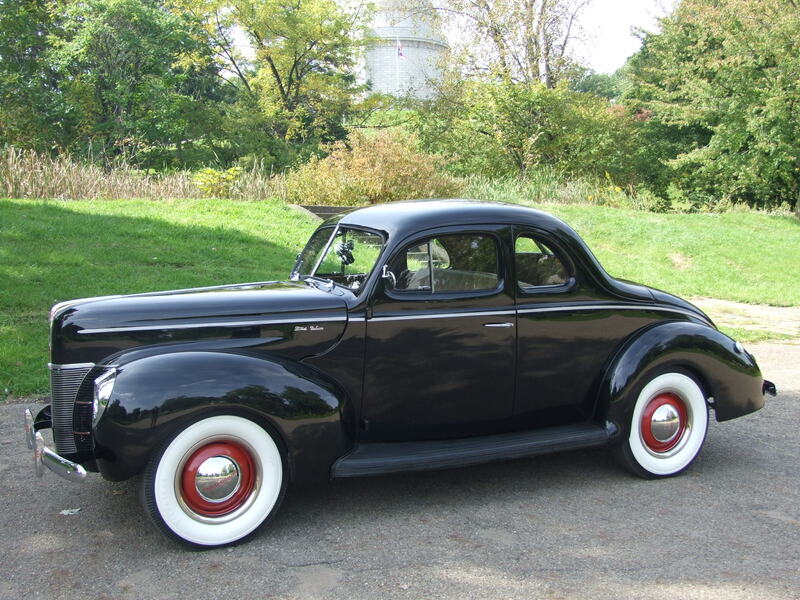 The 1940 Ford is a popular model, that is extremely drive able and comfortable. It is an older car with V-8 power that can cruise at today’s highway speeds, but yet fully enclosed and heated with comfortable seating. This car is a very striking combination with its shiny black finish, fitted with contrasting bright work that just makes it stand out. It has been meticulously gone thought by its current owner and is ready and willing to be driven, shown, and enjoyed should that be the new owners quest. Owner bought car around two years ago. Paint, body, chrome, and interior(headliner, door trim, seating, materials, carpet, gauges, and dash board) has been restored. * It is extremely smooth and shiny, polished to the highest degree and matches all the way around. * It is all very highly detailed and buffed. Even around the edges where typically they do not get polished out as well, however this car is beautifully done. * Current owner is not sure on the age of the paint, but indicated that he has done some minor touch ups. The car has a base coat with a clear coat paint on it, and he used the same process with touch ups. * Do not see any scratches or even light scuffs anywhere. * We found just a couple of light fish eyes near the windshield wiper arm mounts on either side. * Over all the body is beautifully straight and correct, and possibly more so than when it was originally produced. * The fits of the hood, trunk, and the doors are even and we do not see any dents on the car. * Look at the pictures we took closely, and study the panels. The body was expertly done without a question. 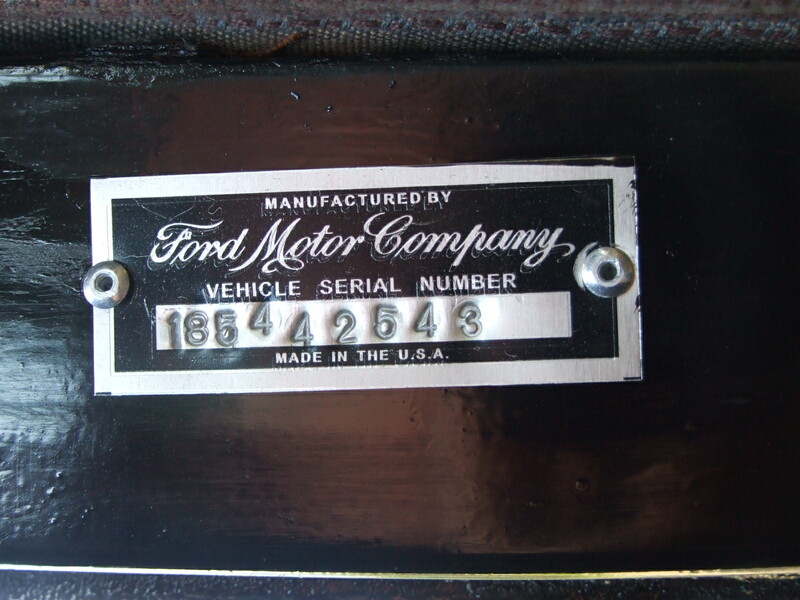 * We did random readings on all panels of the vehicle, and confirmed that all panels are steel. * We did not see a great amount of variation in the readings, or paint depth. * All of the bright work seems to be fastened, and secured to the car as it should be. * The two windshield glasses both have the Safety Plate L.O.F emblem, and the remainder of the glass has no identification. * The glass is all very nice and clear, and the owner indicated that he had put in two new rear glass windows and rubber seals. * The glass is all very clear without delamination, dis-coloring, bull-eyes, cracks, or wiper marks. * The only indication of a little wear is the passenger window has 2 or 3 little scratches that are an inch or 2 long, they are fairly light but do exist. * The dash paint, chrome, knobs, gauges, and steering wheel all look like that of a brand new car. Particularly pay attention to the details such as the steering column, on/off lock mechanism, shifter, and heater box(installed by current owner). 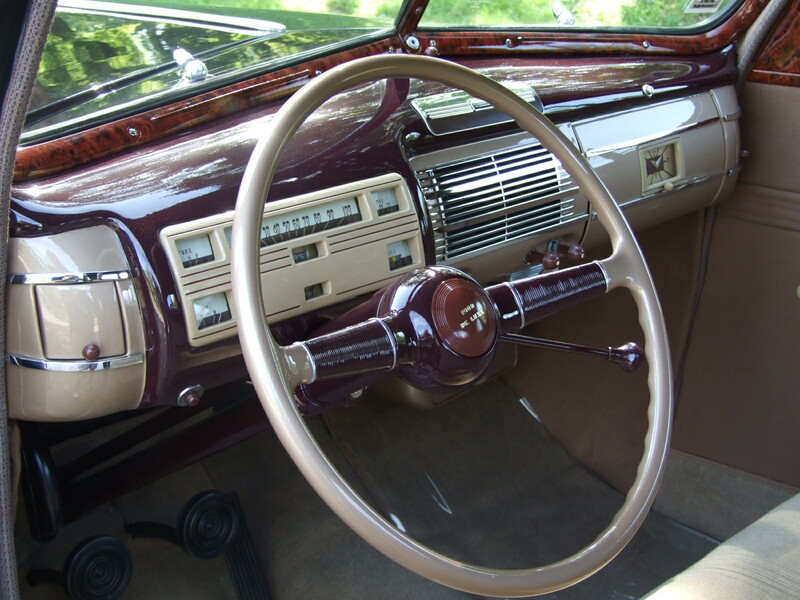 Between the chrome and the color combination, and its restoration it is a very striking interior and dash. * The sun visors, headliner, door panels and kick panels all look to be of the same type material. They have a similar shade, and even if not new, is not showing wear in areas that we would typically see. * The sun-visors are all good and solid, and the backing is good as well. * The seats are a little bit of a lighter color material, but do not show any worn areas and have held up very well. * The carpet looks like a newer replacement that is custom cut and fit, and has good rich color with no wear. * The current owner did a restoration of the simulated wood trim. This included the painting of the dash, and refurbishing of all the gauges. * In the picture the light caused the headliner to look faded but it is not. 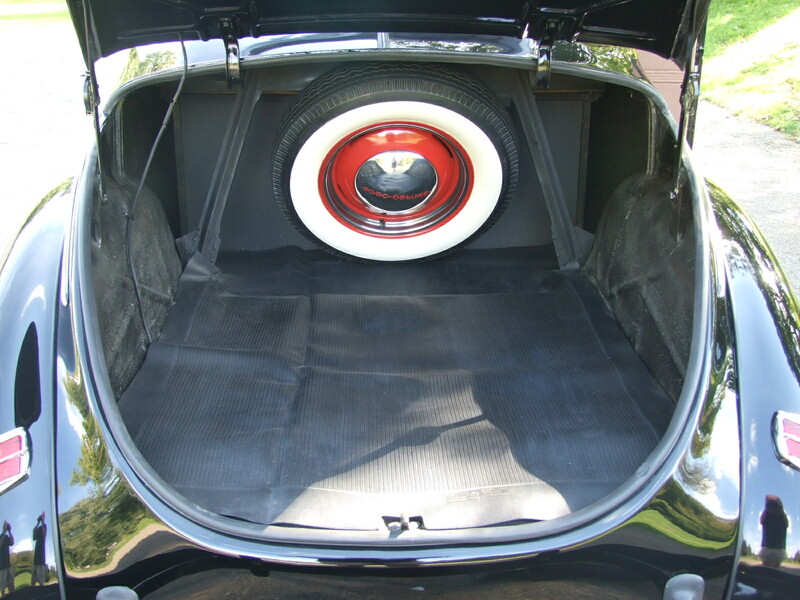 * The trunk is covered with a factory fit rubber mat, and includes spare tire and wheel. * The trunk area includes the wooden compartments covers. If you open the covers you will see some minor body construction that was performed at sometime, which is very typical. * You can see that these tires have hardly been driven on at all. * We do not see any curb damage to either the tires, hub caps, rims, or trim rings. 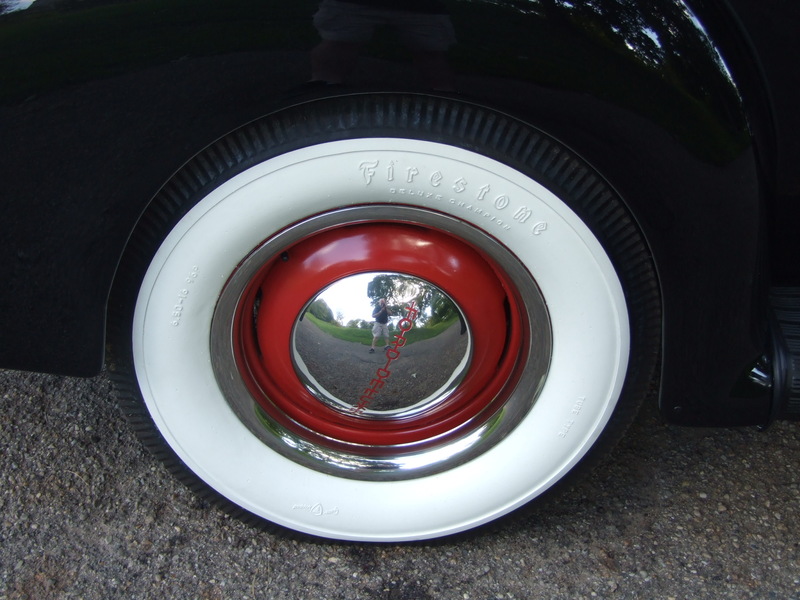 They are pretty much flawless, and are very bright red with Ford deluxe hub caps. 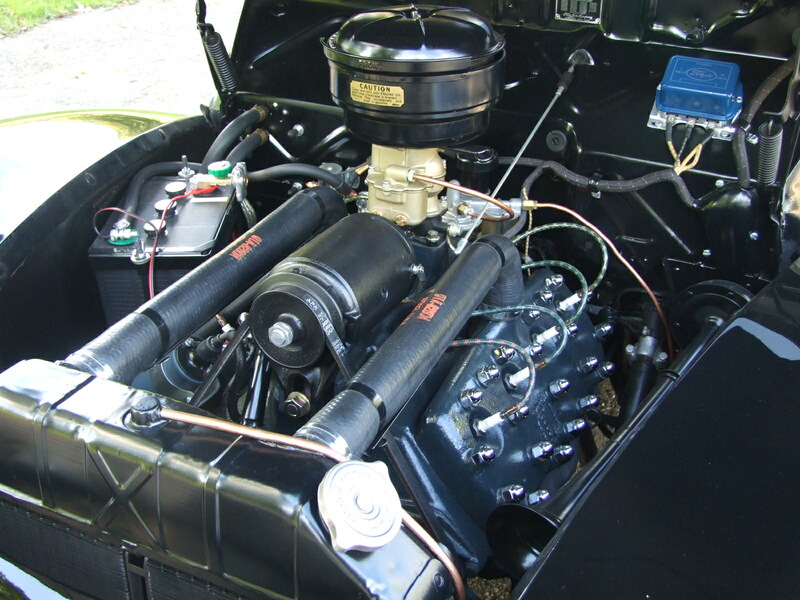 * When you open the hood it is like you are looking under the hood in 1940 in your local Ford Dealer showroom, with the impeccable attention to detail with the engine bay area and the condition of the wiring, cleanliness, and polishing components. Only exception we see is the battery cut off switch, which is of a newer design. It is over all the highest attention to detail that matches the balance of this cars exterior, and interior for being as close to new as possible. * The chassis has been left natural and not coated so you can really see the condition of it very well. * The frame appears all very nice, and solid. * The engine looks very dry without leakage, and just some light seepage that could be coming from the transmission, but not anything un-normal. * We do not see any fluids coming from the rear end. * New radiator, new complete exhaust system, and you can see that the horn, starter, and fuel filter looks newer as well. * The dual exhaust is separated all the way back, and is custom fabricated with nice looking mounts and hardware to keep it set. * The frame has some paint on the outer showing section. The inner chassis has some light surface rust, but we can not see any rust perforation anywhere on the frame. 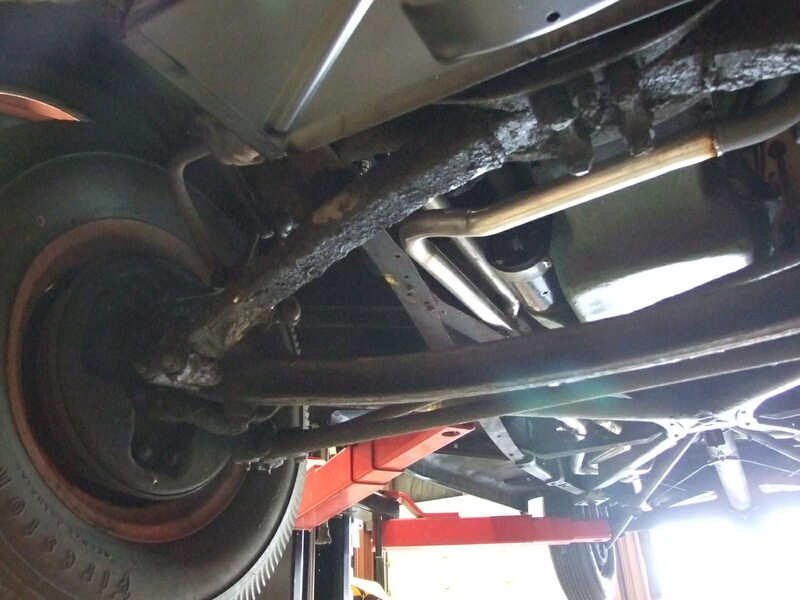 * On the lube fill for the rear end there are some lines around the plug and owner indicated its just scrapping dirt and grease away from plug before checking fluid levels. Chad drove car several miles around town, and also a little bit on open road. It is a 6 volt system but this car fires off immediate. When its cold you have to apply the choke, and when it is warm you do not. Either way it fires immediately before you even hear that slow crank that 6’s typically have, and so it must be set up just right. The engine performs and runs nice and smooth as it should. Clutch works well and so does in all 3 forward speeds, and reverse. It drives very nice and straight down the road. Steering seems appropriate, and upon braking it stops smoothly and sufficiently without pulsation or pulling to one side or the other. It is just a really nice driving vehicle, that is a pleasure and a lot of fun to operate.